A growing dust storm on Mars is seen blurring the planet's features in this photo taken on June 6, 2018 by NASA's Mars Reconnaissance Orbiter. The blue dot shows the location of NASA's Opportunity rover, which is in the dust storm. 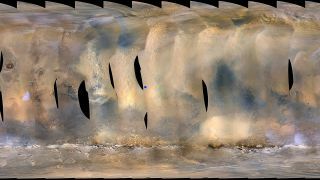 A massive dust storm on Mars has sidelined NASA's Opportunity rover, stalling the robot's science work as it waits out the still-growing tempest. The Martian dust storm was first spotted from space by NASA's Mars Reconnaissance Orbiter, NASA officials said. As of Friday (June 8), the storm covers more than 7 million square miles of Mars (18 million square kilometers), according to NASA. That's an area larger than all of North America on Earth. "Full dust storms like this one are not surprising, but are infrequent," NASA officials said in the statement. "They can crop up suddenly but last weeks, even months." The area blanketed by the dust storm includes Perseverance Valley, Opportunity's current home on the vast Martian plains of Meridiani Planum. Opportunity has been exploring Mars since 2004, but it runs on solar power. With the dust storm clogging up the sky, the amount of sunlight the rover can use to recharge has dropped. NASA compared the conditions to "an extremely smoggy day that blots out sunlight." By Wednesday (June 6), Opportunity's power levels saw a major drop, forcing the rover to stop all science to conserve power. If the storm lasts too long, the main concern will be the Martian cold, a danger Opportunity has faced in the past, NASA officials said. "There is a risk to the rover if the storm persists for too long and Opportunity gets too cold while waiting for the skies to clear," NASA wrote in the statement. Cold is thought to be what killed NASA's Spirit rover, Opportunity's twin, in 2010 after that robot got stuck in the Martian sand. But Opportunity is a survivor. And it's seen dust storms bigger than the one it's experiencing now. A self-portrait of NASA's Opportunity rover on Mars taken by the Microscopic Imager on the rover's robotic arm to celebrate its 5,000th Martian day in February 2018. In 2007, a dust storm on Mars covered the entire planet and forced Opportunity to hunker down for two weeks in a sort of survival-mode of minimal operations. To save power, the rover went days without phoning home to its controllers at NASA's Jet Propulsion Laboratory in Pasadena, California. It was during that 2007 storm that Opportunity's handlers worried about the rover's ability to power its vital survival heaters with the low power levels caused by that dust storm. But Opportunity survived. In fact, Opportunity has been surviving for 15 years. The rover (and its twin Spirit) launched separately to Mars in 2003 and landed in January 2004 for what was originally scheduled to be a 90-day mission. But like the dust storm now battering Opportunity, the rover's mission ballooned from 3 months to 15 years, 14 of them on the Martian surface.